It’s never too early to start good pediatric dentistry habits, like tooth brushing and flossing, as children with good dental habits tend to grow into adults with healthy teeth! As most caregivers and parents know, getting small children interested in brushing and flossing their teeth can be a challenge. That’s why our family dentist in Cary and Holly Springs is providing some tips to encourage dental health with your preschooler in a way to make it fun! When children are given options and can make choices, they are more likely to be excited, or at least willing, to do something. For example, if you offer a few choices for lunch and let them pick, your preschooler is more likely to eat. If your child picks his or her own outfit, they are more likely to get dressed without a fuss. We find that the same applies to pediatric dentistry in Cary and Holly Springs. Let your child pick their own toothbrush and toothbrush holder so they will be more excited to use it. You get to model appropriate toothbrushing practices for your preschooler so they know exactly how to brush their teeth. It becomes a fun activity the two of you can do together. It is important to note that young children are not always precise when brushing their teeth. 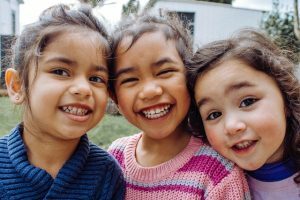 Even if they are brushing the correct amount of time, cavities and decay are common in pediatric dentistry in Holly Springs and Cary often because children aren’t getting exactly where they need to, such as around the gumline and behind teeth. After you brush together, finish brushing your preschooler’s teeth to make sure they are 100 percent clean. If they resist, which is normal, let them finish brushing your teeth first so it feels more fun or like a game! The ADA recommends children (and adults!) brush their teeth for two minutes, two times a day. To small children, this sounds like an incredibly long period of time, so to make it more fun, there are plenty of teeth brushing videos you can play! Elmo’s Brushy Brush song is a favorite, but if your child has a favorite character, they probably have a video to go with it! If you’d prefer to not watch a video during tooth brushing time, we understand! You can get a toothbrush timer app for your smartphone, or go old-school with a toothbrush sand timer you and your child can use to keep track of how long to brush. At our family dentist in Holly Springs and Cary, we see children who brush regularly and thoroughly, but they still have cavities because they aren’t flossing. For preschoolers, you will want to floss for them to make sure you’re being thorough, but if you worry about using traditional floss, consider the floss picks made especially for young children. Those generally do a great job at removing plaque and particles from between the teeth, and you can teach your child how to use them more easily than traditional floss. The American Association of Pediatric Dentistry recommends children begin seeing a dentist soon after their first birthday and continue to receive teeth cleaning and checkups every six months. Not only is preventive care and regular checkups necessary to good dental health for all ages, but by starting young, it erases any fear and fosters a healthy patient-dentist relationship! If you need pediatric dentistry solutions for your preschooler, we’re here to help. At Sninski & Schmitt Family Dentistry in Cary and Holly Springs, we provide compassionate care and a broad spectrum of services for children and adults. To schedule an appointment, call us in Cary at 919-467-2203 or Holly Springs at 919-600-6262 or fill out our convenient online request form!